With the growing prevalence of tablets used in the enterprise by the mobile workforce, the need for mobile data protection and “on-the-go” visual privacy has multiplied. Mobile employees are finding themselves in situations where they need to protect confidential company information while working in public spaces, but still require the ability to share content when collaborating with colleagues. 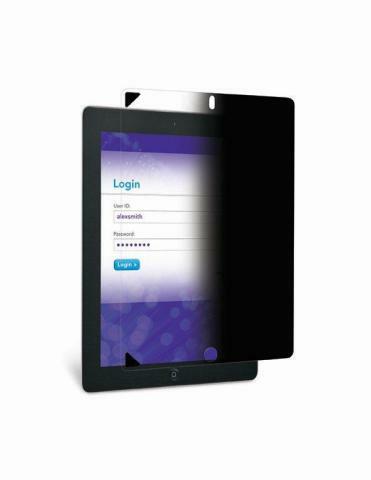 Recognizing this essential need for worker flexibility, 3M introduces new Easy-On Privacy Filters for iPads®, allowing users to stay private when needed and share content when wanted. The 3M™ Easy-On Privacy Filter uses the same microlouver privacy technology found in all 3M Privacy Filters that provides protection from unauthorized side views and data security threats. Thanks to a new patent-pending attachment method, this new removable privacy filter features uniquely-formulated adhesive corner tabs. The washable corner tabs allow the filter to be removed and reapplied hundred of times with a bubble-free application. The 3M Easy-On Privacy Filter also comes with a storage folder to protect the filter when not in use. 3M Easy-On Privacy Filters are now available on Amazon.com, Shop3M.com and other authorized 3M resellers for the Apple® iPad® (second, third and fourth generations) in portrait and landscape orientation for $49.99 or for the Apple® iPad Mini® in portrait orientation for $44.99. For more information, visit www.3Mscreens.com/easy-on and follow us on Spiceworks. iPad and iPad Mini are registered trademarks of Apple Inc.